O Theotokos and Virgin, rejoice! O Mary, full of grace, the Lord is with thee; blessed art thou among women, and blessed is the fruit of thy womb; for thou hast borne the Savior of our souls. I've been reading up on the birthing process as well as the baby's physiological transition from the womb to our world.The process of giving birth to this heavenly, innocent little miracle is so...earthly. A woman in labor can demonstrate fear, joy, carnal behaviors, and experience both the overwhelming physical power of her body and never-before felt fatigue. It is sexual, messy and leaves little room for modesty. It is a beautiful thing; a beautiful, very human thing. All the effort pushes out a colorful little being covered in fluids and, hopefully, screaming its little head off to open its lungs and quick-start its own circulation of oxygenated blood.Most people think that a newborn baby is definitely sweet, but not too cute looking. To imagine Christ God being born,squeezed from Mary's womb, coming out all purpleish-pink, wet and crying is almost unimaginable to me. She probably immediately put him to her breast, and I'm sure he was a good eater. She kept him warm, and he responded to her voice. They bonded like every mother and baby should at birth. It gives me a whole new perspective when I look at Mary holding the child Jesus in her arms as they are presenting each other to the world, cheek-to-cheek (Jesus usually gesturing toward Mary, and Mary toward Jesus). It is so natural. It is as if Jesus is saying: "this is my mother whom I respect and love above all else on this earth". And she is saying:"this is my baby, my son, our God and promised King". He says to the Church: "Love her as I love her; now she is your mother as well" (as he said on the cross to his disciple). And Mary says: "Look to Jesus and adore and honor Him. He is here for you as much as for me. This little one will one day save our very souls." I can't imagine saying/thinking that about my own child! How did she balance the humility that came with knowing that her son is actually her GOD with her duty to nurture, protect, and simply raise this boy?...and balance in her mind her relationship with him as his physical mother and spiritual daughter? Their relationship is a wonderful miracle in itself. I believe that God's grace seeped into every part of her being to sanctify her as no other human will experience/achieve until the Kingdom arrives. Of course her purity was not complete, she was of course human. But who can claim to be closer in communion with God than Mary? And isn't that what purifies us?The closer we get to Him the more his fire burns us. 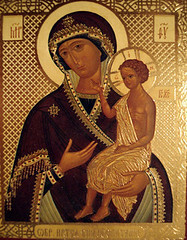 So I am beginning to deeply love and revere the Blessed Theotokos. I praise and thank God for who he made her to be. I can only hope and pray that I will learn to be some part of the woman, mother and true Christian that she is. O Theotokos, by Thine intercession and help we send up glory and thanksgiving for all things unto the One God in Trinity, the Creator of all, now and ever, and unto the ages of ages. Amen. For those of you who don't know, Andrei and I have hired a midwife for our pregnacy care and birth. We'll actually have the birth at the Mountain Midwifery birth center where there will be a midwife, nurse and my doula-sister. No, there will be no doctor in the building. Working in a hospital, I get a lot of comments..."Ooh, you should be careful; she would've died if she weren't in a hospital" or "So and so lost their baby at a 'birth center' b/c a doctor wasn't called soon enough" or "Our baby wasn't responding well to the pitocin so they almost had to do a c-section". I have even gotten looks that say "you're being irresponsible and could affect another life b/c of it." We must remember that a mom's comfort level is vital for having a safe, smooth birth ("stress" hormones can really screw things up). If she's more comfortable in the hospital bed, then that's where she should be. If she feels more comfortable in the birth center or at home, then that's where she should be. Neither side should be quick to judge the other's choices. I'm quickly learning about the huge wall growing between the two 'schools of thought', throwing the balance off in both natural and medical holistic care. At the same time, I am quickly becoming an informed advocate for natural home/birth center births; and if you ask for my opinion, be sure it will be bias. However, don't try to get me on the defensive, trying to convince you why you're wrong for wanting a hospital birth. First of all, it's YOUR birth, not mine. Second of all, I think that giving advice/judgement/opinions should be reserved for those who specifically ask for it. Truly, I'd appreciate the same respect in return. So while I said earlier that I don't get too offended...I guess maybe I do a little bit, despite my efforts not to. I just don't want to be labelled as a bad mom before my baby is even born. I'm sure none of us do. It starts off so romantic and innocent, with love bringing us close in mind and body. We are husband and wife, best friends needing little else than one another. Then comes the inkling that something has changed. Seems unlikely, but I can't shake the feeling. We take a late night trip to the drug store (haven't we all?). I pee and we wait those long 5 minutes. Dumbstruck, crying, very happy, confused. What just happened? Is it real? I feel good, the hazy feeling in my head is gone, my stomach is still, well, as flat as it's gonna get. But I still don't see red. We keep looking at my belly in wonder at what's happening so quietly in there. It's exciting. Surreal! Guess what? !--most people seem to know already. Turns out we aren't the only ones who've been waiting for the news. I've developed a little pooch. Makes me look more out-of-shape than pregnant. I'm not sure what to wear. Then again, who cares? I am pregnant after all. It's not my problem if they think I'm fat. Now I'm feeling lousy. My love, Andrei, diligently peels me an orange each morning while I'm still half asleep to quell the impending storm in my stomach. They say to eat dry crackers, but the orange goes down so well; besides the crackers make me thirsty. The rest of the day, no matter how I try to eat, I feel like I've taken a bunch of vitamins on an empty stomachugh. Eventually the bad days overtake the good ones in frequency. I'm so sick of crackers, broth and Gatorade, but it's so hard to swallow a sandwich. You want me to take what-oil pills? I don't eat fish! I have a hunch this is going to last all nine months. True, it could be worse. And yes, it's a good sign that the pregnancy is coming along. Great. One day it happens. I get up before Andrei, wander around, have some tea. Then I stop: I haven't eaten! Hey, I don't feel so bad! I could get used to this. Sure I still need to eat constantly, but so what? A little fatigue and some growing pains are all that remain of the discomfort. My belly is getting rounder and looking more pregnant. Now all this really does just remind me that our baby is growing. What joy! This is the best time of the pregnancy, they say you have a feeling of well-being, excitement and energy. So far this is generally true for me, with the exception of my increased mood swings (just ask Andrei). I've started exercising little by little, and I'm getting crafty with little baby things (crocheting and cross-stitching). I'm looking forward to being a stay-at-home-mama with little side jobs. It's a girl! Is it cheating to get an ultrasound when there's no real need? Sorta...but what of it? It's so fun to see her unclench that little fist and fan a perfect set of fingers. Seeing her body for the fist time is amazing. He tiny heart pumps mightily with all four chambers, and all her organs are there and in their proper places. She kicks and pounds, letting us know we're invading her space with that probe. She's lying vertically, head down next to a soft cushion, my bladder! Hey I'll pee a hundred times a day for you, princess. I want her to know her papa's voice, especially. When he says his evening prayers, we are right beside him taking in the sound of his voice and of his faith. He kisses her goodnight and good morning and tells her how much she's loved. She's even been serenaded by his favorite band Red Hot Chili Peppers via an earphone in the belly button; apparently there are great acoustics in the womb! This is one lucky little girl to have such a good papa. I can't wait for us all to meet. These days I'm beginning to really wonder: who are you, little one? Will you be boisterous and active or more of a chiller? Either way, I know you'll have a will of iron like your parents. You won't leave us guessing, that's for sure. Will you be more interested in dolls or tools or things that go? Of course you're amazing, whoever you are. However you come out physically/mentally, you'll be perfect. You're being made for us, and we, your family, have been made for you. We will all grow through our imperfections together and prove to be a perfect match. I am enjoying the the easy networking on myspace, but am getting tired of not being able to access my site b/c of technical difficulties. I'm going to give Blogger a go and see if I like it. It's nice to have a place to write my thoughts as I read interesting books and go through new experiences in life. I definitely blog more for my own good than for making an imprint on the world with my amazing thoughts. I need a way to unload my mind so I'm better able to shut it off at night.